Description of "Natural Massage Oil Recipes (eBook)"
It is the science of healing that involves the human touch. For several decades now, people have been making use of this option to treat their physical and emotional problems. By applying a massage oil or ointment at the area you work at, you ease the massage work and increase the effects of the massage. Your fingers glide more easily upon the skin covering the area. The blood supply of the skin and muscles will be stimulated. You get a sensual and exciting scent on the area and in the air. Ingredients in the oil will ameliorate muscular ache and pain. According to the composition of the massage oil, there will be different stimulating effects upon the muscles, for example faster regeneration of tired or hurt muscle tissue. 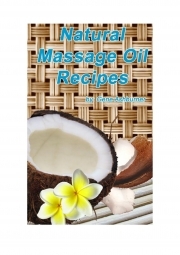 Reviews of "Natural Massage Oil Recipes (eBook)"